It was first light on an outgoing tide. My clients and I were drifting toward a submerged rock pile 30 yards ahead when my sonar screen began marking huge boomerangs. It could mean only one thing – we were moments away from our first big striper of the morning. Right on cue, the live bait closest to the rock pile surfaced and swam in tight corkscrews. I grabbed the rod and pulled the bait out of harms way as my client picked up a fly rod and threw a large streamer directly behind the swirling bait. After a few fast strips the fly winked out of site – fish on! A healthy 25-pound class striper began putting the 9-weight outfit to the test. Two more big bass engulfed the other baits before we could clear them. Within a few minutes, all three fish were landed and released. Why such a concentration of quality fish? It’s the spring striper run in the western end of Long Island Sound. What makes this experience more amazing are the logistics – my clients made it back to New York City in time for their lunch meeting. I picked them up later that afternoon on the eastern side of Manhattan and we headed back out to Long Island Sound. The evening was spent working open-water bunker schools with big live baits and chunks. The action was non-stop until sunset, with the largest fish just under 40 pounds. Anglers traveling to the New York City area in late spring have a unique opportunity to experience one of the finest and most consistent trophy striped bass bites in the world. Not only is there a concentration of fantastic fish, but the logistics seem almost absurd. Most of the charter operations that specialize in this fishery are based in Port Washington, Long Island, or in City Island and New Rochelle on the mainland. Charters with faster boats offer pickups in Manhattan and in nearly every port on the south shore of the mainland. Another option is to take a 30 to 45 minute train ride or car service from Manhattan. There is no “roughing it” in the western sound. Run times on the water tend to be short, water conditions are typically calm and there are excellent accommodations and dining throughout the area. BIOLOGY OF A BITE Striped bass have two major spawning stocks – Chesapeake Bay fish and Hudson River fish. Both populations migrate north in spring and tend to summer in New England and western Long Island. Most Chesapeake fish migrate along the south shore of Long Island while Hudson fish use Long Island Sound. The fish we target tend to have more girth than the Chesapeake fish and really put on a show when hooked! By late April or early May, the Hudson spawners start to move out of the river, passing beneath the Throgs Neck Bridge and into the western sound. They come out in waves, progressing from west to east. The speed of their migration is tempered by the availability of bait. A specific group of fish may linger in an area for several days if the bait is thick. Savvy charter captains have a good idea of the composition and location of each body of fish and where they’re headed. 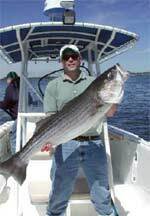 The western portion of Long Island Sound is fairly narrow and crannied, with dozens of prime striper spots on both the north and south shores. The trophy spring bite usually lasts through mid-July, provided the water stays cool. By late July most of the big fish have headed north and schoolie stripers and monster bluefish take over. 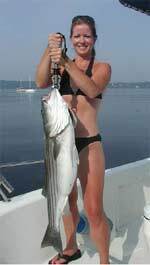 The truly big stripers don’t return again in numbers until late September. The western sound’s trophy striper bite is very diverse. At dawn, shallow, protected waters typically produce the most fish. As the sun moves higher the bite shifts to the deeper waters. By sundown, as the stripers become more active, bunker schools in open water start to produce. Some of the best action occurs around these schools as anglers use big treble hooks to snag bunker, then drop them back into the bait ball. Occasionally, the big bass will blitz a school of bunker and large Yo-Zuri Surface Cruisers and Crystal Minnow Magnums are deadly. Anglers use big lures for maximum casting distance and surface commotion. Chunking, though not as glamorous or challenging as live-lining bait, plugging, or fly fishing, provides excellent action after dark. This bite is best experienced in smaller center consoles and pilothouse boats using live bait and fly fishing. A typical trip may include fishing in waters as shallow as three feet or as deep as 90. The day usually starts with a few minutes of tossing a cast net for bait, then a high speed ride to potential hot spots. It’s not unusual to catch a dozen or more legal size fish on a half-day trip. Many of these fish are over 20 pounds, with a fair share topping 30 and 40 pounds (the western sound rarely gives up 50’s). Most of the bait fishing is done on conventional 20-pound and 30-pound tackle, while 8-weight and 9-weight fly rods are sufficient. Individual captains have their own gear preferences, so it’s a good idea to discuss in advance. Area charters cater to the traveling angler; all you need to bring is a camera. The largest fish are all females, so many of the captains encourage release, but anglers often take fish home. It is important to let the captain know at the time of booking that you intend to keep a fish. Though there’s no such thing as a sure thing when it comes to fishing, the spring trophy bass bite in western Long Island Sound is about as close as it gets. Add a day or two to your travels and see what the bite is all about.